We take great pride in sourcing high quality local produce and handle it with great care and we enjoy telling beautifully curated stories through stunning imagery of our monthly menu changes, cocktail additions and special events. Winter time has reached the Bistro and rich & vibrant flavours are the theme for the menu this December with heartwarming dishes such as Slow Cooked Lamb Shoulder through to a zesty Gin & Beetroot Cured Salmon. Three new festive desserts adorn the menu and they are each more charming and delectable than the last. This month, our Head Chef has replaced the last of the summer dishes with exquisitely seasonal winter warmers. Rich and luxurious, we see hot starters, such as the Cod Brandade w/ Soft Poached Egg, Piccolo Peppers & Pisto Dressing, heartwarming mains; like the Braised Beef w/ Mash Potato, Carrot, Baby Onion & Mushroom and a delicious variety of refreshing and comforting desserts. The change of season brings an abundance of fresh October produce and Head Chef Pierre has added richer dishes that exude warmth, comfort and earthy notes. We’re talking a veritable flourish of autumnal colours with butternut squash, aubergine and celeriac all making their seasonal debut. The end of summer sees our chefs introduce a delicious variety of autumn ingredients and richer, heartier flavours to the W5 menu this month. Seasonal vegetable purees are in abundance and the dishes have become more luxurious, assorted with autumnal herbs yet still retaining that fresh summer zest. 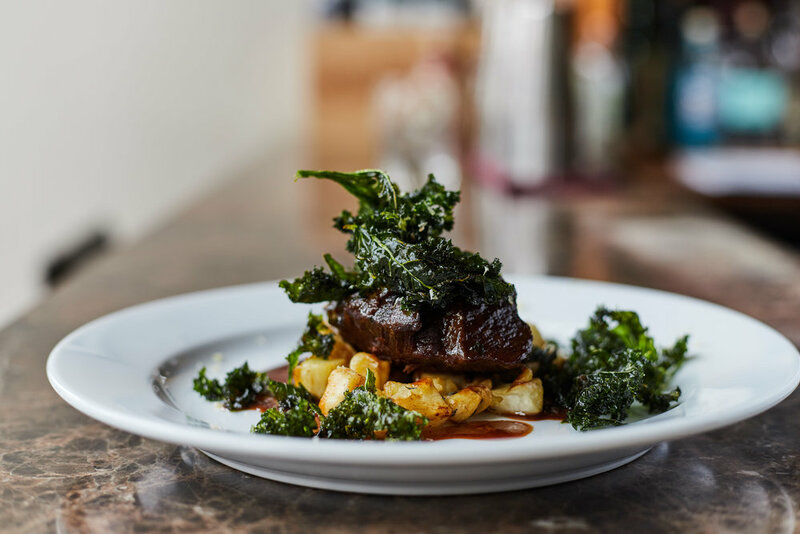 The July menu at Charlotte's Bistro is full of delicious dishes that are unusual takes on heavier classics - exhibiting a summery seasonality that we have not yet seen on the menu this year. Head Chef Pierre cites his favourite new additions as the Red Snapper w/ Couscous, Capers & Olives & Harissa Crème Fraîche and the Gazpacho Soup . w/ Rosemary Croutons as both are exquisitely fresh and zesty and Pierre says that they were inspired by what he imagines one would eat on a summer holiday. Head Bartender, Tom Byrne, has also added two delicious new cocktails, which he describes as 'porch drinks', the perfect antitdote to keep the heat away. Summer has finally arrived at Charlotte's Bistro and our Head Chef Pierre has used the explosion of fresh June produce to bring zest and colour to the new menu. With the addition of dishes such as Beef Carpaccio w/ Pomegranate, Mushrooms & Rocket and Truffle Oil and Panna Cotta w/ Summer Berries & Almond Biscuit we see fresh takes on traditional classics infused with summer fruits and veg. The two fiery new cocktails that Head Bartender Tom has introduced are the perfect starter to these delectable delights. The delightful additions to the Bistro menu this May are guiding us through a lovely transition from spring to summer. The new dishes are refreshing with delectable hints of citrus, ranging from Roast Pork Belly w/ Watercress Purée, Black Pudding & Caramelised Apple to a deliciously fruity Strawberry and Mango Pavlova. Prepare yourself for British classics with a fresh and summery Charlotte’s twist. The Bistro bartenders have also curated some new exquisite summer cocktails that are an absolute must try! Spring is here and with it comes an abundance of new, seasonal produce. We see a multitude of asparagus, spring greens and artichoke across the dishes on the Bistro Menu this month with a strong focus of fresh vegetables. From Duck Rillettes w/ Apple & Gooseberry Chutney & Toasted Baguette to Beef Rump w/ Artichoke & Pak Choi & Caramelised Celeriac Purée, the dishes are becoming lighter and more invigorating with a melee of exquisitely zesty tastes. This month's menu additions all share a similar 'freshness and zestiness' - perfect for pulling us out of the bleak midwinter and into the gentle thaw of spring! We see a lot of citrus elements and refreshing sprinklings of herbs paired with heartwarming meats and fishes - rendering this one of Bistro's most refreshing and deliciously diverse menus to date. Head Chef Pierre Simonin's has declared this his favourite menu since he took the helm in September last year. Most dishes have changed, with a few steps towards spring including a Slow Cooked Lamb Stew with Rosti Potato, and an exquisite Crème brûlée with Rosemary. He's proving rather proficient at marrying British ingredients with Gallic flair and a Charlotte's twist!